For nearly three decades—from 1962 through 1989—Cuban national income and product accounts were constructed based on the Material Product System (MPS), a methodology developed by the former Soviet Union and applied by other socialist countries. MPS aggregates were not comparable to those of most other nations, who followed the System of National Accounts (SNA) developed by the United Nations. In the early 1990s, with the disappearance of the Soviet Union and dissolution of the socialist bloc, Cuba abandoned the MPS and began to construct national income and product accounts based on the SNA. Gross domestic product (GDP) statistics, the most commonly-used SNA aggregate, have been available in Cuban statistical publications that provide data back to 1990.1 These GDP figures are not comparable to macroeconomic aggregates produced during the time when Cuba applied the MPS methodology,2 thus giving rise to one of the many discontinuities in national accounts statistics. The adoption of the SNA beginning in the 1990s is a welcome development, as Cuban national income and product accounts are no longer different conceptually from those produced by virtually all other nations. Cuba, however, has altered in various ways the SNA methodology and therefore interpretation of the data published by Cuba gives rise to numerous challenges.3 This paper has two objectives: (1) analyze discontinuities in official GDP statistics and lack of documentation on the several methodological changes that have been implemented, and (2) present some puzzles regarding official Cuban GDP statistics that raise questions about their reliability as indicators of overall economic performance. Through 1989, Cuba’s first statistical office under the revolution (Comité Estatal de Estadísticas: CEE) compiled and published Cuban macroeconomic indicators based on the MPS. The CEE’s annual statistical yearbook, Anuario estadístico de Cuba (hereafter AEC), published regularly since the 1970s, included official statistics on national accounts; the principal macroeconomic indicator under the MPS was the global social product (GSP). With the economic crisis that enveloped Cuba in the early 1990s, largely provoked by the collapse of the USSR and the dissolution of the socialist economic community, Cuba halted publication of the AEC with the 1989 edition (which appeared in 1991, already in the midst of the crisis) as well as other statistical publications. 4 In 1995 and again in 1996, Cuba’s Central Bank (Banco Nacional de Cuba: BNC) issued reports that provided GDP statistics for the period 1989– 1995, now based on the SNA.5 It was not until 1998, however, that the publication of the AEC was resumed (with issuance of the 1996 yearbook6) now under the responsibility of a new National Statistical Office (Oficina Nacional de Estadísticas: ONE). In 1997, the Economic Commission for Latin America and the Caribbean (ECLAC) published a major study on the Cuban economy, with a second edition in 2000.9 In preparing the study and the accompanying statistical annexes, ECLAC relied on published and unpublished statistics provided by ONE. Available in these reports—although not officially published in Cuba—are GDP statistical series for 1985–1998 at current and constant prices of 1981, presumably compiled using the ONE methodology and therefore comparable to those published in the AEC for the same period (see Table 1, columns 2 and 5). It can be observed in Figures 3 and 4 that the trends in GDP series from AEC and ECLAC for 1990–1998— the time period for which series from both sources are available—are very similar. GDP growth rates calculated from either series are relatively similar also. Absolute GDP values, however, are consistently higher each year in the ECLAC series than in the AEC series. At current prices, annual differences range from about 6% to about 10%, whereas at constant prices, differences range from 7% to 10% in 1990–1992, but for 1993 forward consistently around 12% (see Table 1, columns 3 and 6). 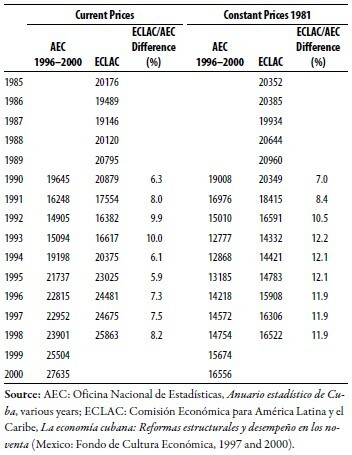 In the ECLAC series, GDP at constant prices in 1998 was 21.8% lower than in 1990, compared with 25.2% in the AEC series. The reasons for the differences in the two series have not been explained either by ECLAC or by ONE. Beginning with 2001, Cuba rebased its national income statistics, switching the base year from 1981 to 1997. National account statistics with the 1997 base have been published through the year 2007 in various editions of the AEC, which introduced at least three different series associated with modifications to the calculation methodology. In this section we will discuss rebasing and other minor changes. The remaining changes are analyzed in the following sections. • changing the temporal reference period of an index number series or some other measure. The weights, the price reference period, and the temporal reference period may be changed at the same time, but not necessarily so. Comparability of series: The figures presented in this chapter are calculated on the basis of current prices and, for the principal aggregates, also in comparable terms [constant prices]. The former represent the transactions that occurred according to prevailing conditions during the reference period and therefore correspond to prices, methodology, and institutional structure of each year. The constant-term series is based on prices and the economic structure of 1997. The methodology relied on extrapolation using Laspeyres physical volume indexes of the aggregate sector values during the reference year with as much disaggregation as possible. It appears, then, than the rebasing of Cuban statistics involved changes in base year, weights, and prices. The Cuban government has not released information regarding the specific goods included in the baskets, their relative importance, and the level at which the transaction is measured (e.g., retail, wholesale). For services sectors, the lack of information is even more acute. Cuba has not ever published information on which measures of performance of services sectors are collected by the national economic activity classification system and are included in the national account statistics and their value, or about indirect indicators of activity that ostensibly also have been used for some services activities. In the absence of these data, it is impossible to analyze the thoroughness of the rebasing exercise and to interpret the statistical results. At the start of 21th century, Cuba began a systematic effort to “adapt” the SNA methodology to better reflect the nature of its economy. The government’s argument was that the traditional SNA methodology, with its emphasis on measurement of products and services exchanged through market transactions, significantly undervalued Cuba’s GDP, which included a large component of state-provided services offered to the population for free. Cuba could have set aside the SNA altogether and developed its own measure of national output independent of international benchmarks, but instead chose to alter the international methodology to fit its objectives. The result of this decision has been widespread obfuscation, disagreements between Cuba and regional and international organizations, and overall lack of confidence on the validity of that nation statistics, e.g., they showed extremely high growth rates that seemed to be inconsistent with other economic performance indicators. Some … [poor countries] have Gross Domestic Product three times greater than Cuba’s and hundreds of thousands of illiterate persons and persons who do not receive medical attention because they practice the doctrine of neoliberalism and include in their GDP the production of numerous free zones. The claim that the value of health care, education, social security, and other services provided by the government was not counted in Cuban GDP statistics during the Special Period is directly refuted by the methodological notes to AEC. For example, said notes to AEC 1998 state that among the activities included in Cuban GDP calculations were: “Activities of government services: Their production is valued based on the explicit costs associated with the provision of the services, that is, based on expenditures on goods and services inputted, depreciation of fixed assets, salaries and other forms of remuneration earned by the personnel offering the services, and corresponding social security payments. These activities are comprised of units subject to the national, provincial or municipal budgets.”22 The mentioned methodological notes also indicate that banking and insurance services and housing services, which are not social services, were also included in GDP calculations through the use of proxy variables. … it should be noted that, as we reported to the National Assembly last year, we have been working on a methodology that would reflect more precisely the economic development of our country, considering that the traditional manner of calculating GDP underestimates social services as they are provided for free, which do not have profits or other charges attached to them. The indicator (GDP) reported today has been calculated using tariffs or prices for services offered that better reflect the value added created within GDP. It should be noted that the methodology used only reflects partially the qualitative transformations that that social services have reached in our country. Rodríguez did not report a growth rate for 2004 based on the “conventional” approach to measure GDP. However, a well-connected foreign journalist wrote in January 2005 that economic ministry sources had told him that Cuban GDP growth in 2004 based on the “conventional” GDP formula was 2.8% to 3.0%,25 compared to the 5% official growth rate. This means that the growth rate derived from GDP calculated under the new methodology was 67% to 79% higher than under the “conventional” approach. 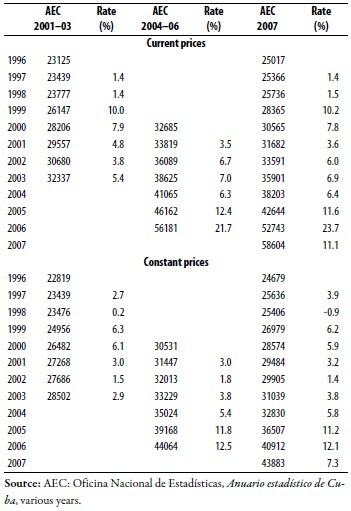 Table 3 compares two series of GDP statistics at constant prices of 1997 for the 2000–2003 period based on: the 2003 AEC and earlier issues, and the 2004 AEC. For each of the four years, the 2004 series— which includes the revaluation of services using a new set of tariffs or prices—was consistently higher by 15.3% to 16.5% than the earlier unadjusted 2003 series. Thus, the addition of the value of free social services resulted in a boost of 15–16% in GDP value. The growth rates for 2002 and 2003 obtained from GDP after services were revalued were higher by 18% and 29%, respectively, compared to the unadjusted GDP data. ECLAC, in its annual “note” summarizing economic development and prospects in each of the countries in the region for 2004–2005, reported Cuban GDP growth in 2004 at 3.0%, and did not include in the body of the “note” the 5% GDP growth rate reported by Cuban officials.26 However, ECLAC stated in a footnote: “Cuba is in the process of implementing a new methodology, consistent with the principles of the System of National Accounts 1993 Manual, to compute GDP that would correct measurement problems that arise from various distortions in the structure of relative prices. This has led to the estimation of a growth rate of GDP of 5% in 2004.”27 That is, Cuba’s estimate of GDP incorporating the revalued services was higher than the growth estimated by ECLAC by 2 percentage points or by 66%. Cuba does not make up its statistics and does not manipulate them for electoral purposes. It abides responsibly by the internationally-recognized statistical systems and defends its right to have its accomplishments reflected cleanly, without resorting to lies or deceit. This last reference was a not-so-veiled criticism at ECLAC, which had begun to question Cuban GDP statistics since 2004 and had not embraced Cuban official statistics in regional aggregates since that year. 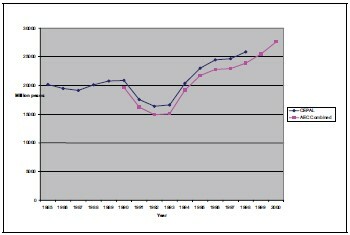 In its 2006 annual regional report, ECLAC reproduced the 12.5% GDP growth rate, attributing it to ONE, but omitted the cautionary statement in the previous edition, although a summary table that included said growth rate had a footnote saying that the figures were provided by the Cuban government “elaborated according to a new methodology that is being analyzed by ECLAC and the Cuban authorities.”36 ECLAC solved the problem of the competing Cuban GDP growth rates in the statistical annex by presenting two Cuban GDP time series: (1) the first running through 2004 consisting of a combination of official growth rates and estimates by ECLAC for some years; and (2) the more recent (and very high) growth rates for the period 2001–2006 from ONE, as is acknowledged in a footnote. Meanwhile, ECLAC’s 2007 note on the Cuban economy was very sparse, mentioning the 7.5% GDP growth rate reported by Cuban official sources, without any qualification or indication that the figure was under review or subject to a review process.38 In the statistical appendix, ECLAC continued the practice begun in the previous year of reporting two GDP series for Cuba. According to ONE, it engaged in very intense technical consultations with ECLAC in 2008 with the objective of “perfecting” its national accounts methodology by adopting best practices in the application of the SNA to the calculation of Cuban national accounts.40 Reportedly, three ECLAC technical missions traveled to La Habana between April and May 2008 for this purpose. As a result of these consultations, ONE revised estimates for 2000–2006 of the value of nonmarket services in the “community, social, and personal services” sector and calculated estimates for 2007 following the new methodology; ONE further linked the 2000–2007 estimates with national accounts statistics for earlier periods to create a GDP series with consistent methodology for the twelve-year period 1996–2007. The revised statistics arising from this third methodological adaptation were reported in a special publication of ONE issued in July 2008 titled Serie de Cuentas Nacionales de Cuba: Años 1996– 200741 and also published in AEC 2007. Table 4 brings together Cuban GDP statistics, in current and constant 1997 prices, compiled from annual AEC publications starting in 2001. Three different series are presented: (1) for the period 1996–2003 compiled from the AEC issues for 2001–2003, which embody some of the early methodological changes such as rebasing and changes to estimation of the contribution of banking, insurance, tourism. and self-employment; (2) for the period 2000–2006 compiled from the AEC 2004–2006 issues, which incorporates the value of free social services, revaluation of the importance of community, social and personal services, and the valuation of exports of professional services; and (3) for the entire period 1996–2007 from the AEC 2007, which in addition to the changes mentioned above, also purportedly follows SNA methodology. The three series are plotted in Figures 5 and 6 (current prices and constant prices, respectively). 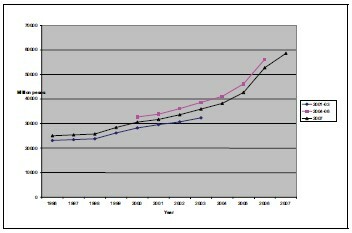 Figure 5, which plots the three absolute GDP series from the AEC at current prices, shows that while trend lines in the three series are similar, the 2001– 2003 one lies below the other two, consistent with the “adaptation” of the methodology in stages that has been described in this paper. The second stage of the “adaptation”—essentially a change in the relative importance of social services and incorporation of exports of services at market value in 2004–2006— resulted in an increase in the level of GDP at current prices of about 14% to 19%. The methodological changes introduced in 2007 and applied to statistics for earlier years—a change in the weight of the services sector and other adjustments to the methodology of calculation that reportedly brought the overall methodology closer to the SNA—resulted in a reduction of 6% to 7% in the level of GDP, roughly half of the gain registered earlier. Still in the comparable period 1996– 2003, GDP values in the 2007 series were from 7% to 11% higher than in the 2001–2003 series. The 2007 adjustments may have been the ones that ECLAC officials referred to in their December 2008 statement. It is also evident from Figure 5 that the GDP trend line became much steeper beginning in 2004, consistent with the very high growth rates reported by Cuban officials for 2004–2006, although growth flattened out in 2007. Figure 6, which plots the three absolute GDP series at constant prices, shows very similar patterns to those associated with the corresponding current price statistics in Figure 5. The values of GDP in the series culled from AEC 2004–2006 issues were 15% to 16% higher than for those culled from AEC 2001–2003. The methodological changes introduced in 2007 resulted in 6% to 8% GDP values lower than those culled from AEC 2004–2006, and were applied to statistics for earlier years as well. Still in the period 1996–2003, GDP values in the 2007 series were from 8% to 9% higher than in the 2001–2003 series. The trend lines become steeper in 2004, but less so than for the current price data, as the barn busting growth rate of over 20% in 2006 from GDP at current prices becomes a 12%-13% growth rate from GDP at constant prices. The comparison in the period 2001–2006 of the AEC 2004–2006 series (before the third adjustment) and the AEC 2007 series (after said adjustment) reveals a significant difference between absolute GDP values and their annual growth rates, as the latter are virtually identical both at current and constant 1997 prices (Table 5). In current prices the average rate for the six years before the adjustment is 9.58% where it’s 9.70% after the adjustment, the difference being only 0.12 percentage points higher in the latter. In constant prices, averages are 6.38% before the adjustment and 6.23% after it, for a minute 0.05 percentage points lower in the 2007 series. 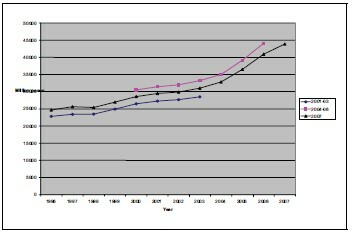 The change in growth rates is not consistent in the 2001–2006 period. At current prices, the 2006 growth rate in the 2007 series is 2 percentage points higher than in the 2004–2006 series and slightly higher rates are also noted in 2001 and 2004, where the opposite is true in 2002, 2003 and 2005. At constant prices, the 2006 rate is slightly lower in the 2007 series vis-à-vis the 2004–2006 series and this is true also in 2002, and 2005, while the opposite occurs in 2001 and 2004, and rates are identical in 2003. There is no reasonable explanation for these inconsistencies. 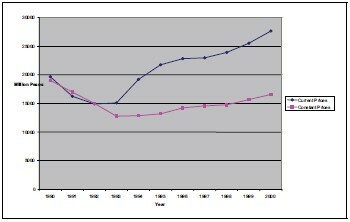 From 1961 to the start of the 1990s Cuba’s national account statistics were computed on the basis of the MPS methodology and were not comparable with those of most countries in the world. Cuba’s decision in mid-1990s to convert its national statistical system to the SNA was a welcome development. Under the Special Period, Cuba’s series on GDP growth rates in 1990–2000, at current and constant 1981 prices, exhibit significant disparities in several years that cannot be explained by official inflation rates. Statistical series on absolute GDP values, at current and constant 1981 prices, available for 1991– 2000 from ECLAC and the AEC (both based on Cuban sources) are remarkably different: the former were consistently higher each year (ranging from 6% to 12%) than the latter. No explanation has been given for these discrepancies. 3. 1996–2007 based on the AEC 2007: Since 2007 there has been a methodological adaptation of Cuba’s GDP purportedly to make it closer to the SNA, including a revision of community, social and personal services. ONE has released only the barest information with regard to the calculation of those changes and not made available the underlying data that would allow independent observers to verify its calculations. The shift in the base year from 1981 to 1997 generated an annual average increase of 60% in the value of GDP in 1996–2000, whereas the measurement changes in GDP related to services raised it by an average of 2 percentage points. These anomalies have not been explained. • growth rates in both current and constant prices for the period 2001–2006 between the second and the third series are very similar, their six-year averages are virtually identical, and they show inconsistent changes. ECLAC and some other international organizations48 questioned the methodology and results of Cuba’s “adaptation,” although at present it appears that ECLAC is satisfied that Cuban absolute GDP and growth rates are being calculated in a manner consistent with the SNA. 1. The Cuban statistical yearbook for 1996, Anuario estadístico de Cuba 1996, confirms in its methodological notes (p. 73) that GDP statistics for 1990 forward are based on the SNA. 2. For a comparison of Cuba’s two accounting systems and their aggregates see Carmelo Mesa-Lago and Jorge Pérez-López, A Study of Cuba’s Material Product System, Its Conversion to the System of National Accounts, and Estimation of Gross Domestic Product per Capita and Growth Rates, World Bank Staff Working Papers No. 770 (Washington: World Bank, 1985). 3. See, e.g., Carmelo Mesa-Lago, “Las dificultades para medir el crecimiento económico cubano,” Revista Vitral, No. 63 (September-October 2004), http://www.vitral.org/vitral/vitral63/econo.htm. 4. Partially filling the gap created by the absence of official statistics, some Cuban scholars made GSP estimates for 1990–1993, e.g., Julio Carranza, “Cuba: Los retos de la economía,” Cuadernos de Nuestra América, no. 19 (1993) and Julio Carranza, Luis Gutiérrez and Pedro Monreal, Cuba: La restructuración de la economía. Una propuesta para el debate (La Habana: Editorial de Ciencias Sociales, 1995). 5. Banco Nacional de Cuba, Reporte económico 1994 (La Habana, 1995) and Reporte económico 1995 (La Habana, 1996). Earlier, a Cuban journalist published semi-official GDP statistics for the early 1990s; see Ariel Terrero, “Tendencias de un ajuste,” Bohemia (October 28, 1994). 6. Oficina Nacional de Estadísticas, Anuario estadístico de Cuba 1996 (La Habana, 1998). 7. The reforms generated price increases ranging from 7% to 525% in 1,510 rationed consumer goods, including most essential foodstuffs and manufactures, as well as many services. See Carmelo Mesa-Lago, Market, Socialist, and Mixed Economies: Comparative Policy and Performance—Chile, Cuba, and Costa Rica (Baltimore: The Johns Hopkins University Press, 2000), p. 235. 8. Carmelo Mesa-Lago and Jorge Pérez-López, Cuba’s Aborted Reform: Socioeconomic Effects, International Comparisons, and Transition Policies (Gainesville: University Press of Florida, 2005), p. 29. 9. Comisión Económica para América Latina y el Caribe, La economía cubana: Reformas estructurales y desempeño en los noventa (Mexico: Fondo de Cultura Económica, 1997 and 2000). 11. Anuario estadístico de Cuba 2001, p. 95. All translations from Spanish have been done by the authors. 12. Mesa-Lago and Pérez-López (2005), p. 30. 13. Calculated on the basis of 1981–base GDP of 16,556 million pesos and 1997–base GDP of 26,482 million pesos and population of 11,217,000 persons. All data from Anuario estadístico de Cuba 2001. 14. Anuario estadístico de Cuba 2001, pp. 85–86. 15. The disparity in the current-price series was observed by Oscar Espinosa Chepe, “Anuario Estadístico: una inexplicable modificación,” Encuentro en la red (January 18, 2003). 16. Osvaldo Martínez, “Entramos al siglo XXI con la economía creciendo, pero aún más importante, con la dignidad multiplicada,” Granma (22 December 2000). 17. Ledys Camacho Casado, “Al Siglo XXI con la economía creciendo,” El Economista de Cuba Digital, http://www.eleconomista. cubaweb.cu/2000/2001/nro127/127_163.html. 18. Fidel Castro, Discurso en la clausura del IV Encuentro Internacional de Economistas, el 15 de febrero de 2002, http://www.cuba.cu/ gobierno/discursos/2002/esp/f150202.html. 20. José Luis Rodríguez, “Informe de los resultados económicos del 2002 y el plan económico social para el año 2003,” Granma (December 26, 2002); http://www.cubagob.cu/des_eco/mep/discursojlrannp.htm. See also Michel Suárez, “Más claro ni el agua,” Encuentro en la red (January 6, 2003). 21. Osvaldo Martínez, “La hermosa paradoja de la economía cubana en 2002,” El Economista de Cuba Digital, http://www.eleconomista. cubaweb.cu/2002/nro188/188.406.html. 22. Anuario estadistico de Cuba 1998, p. 75. 23. José Luis Rodríguez, “Informe de los resultados económicos del 2003 y el plan económico social para el 2004,” Granma (December 25, 2003); http://www.cubagob.cu/des_eco/mep/informe_sobre_los_resultados_eco03.htm. 24. José Luis Rodríguez, “Informe de los resultados económicos del 2004 y el plan económico social para el 2005,” http://www.cubagob. cu/des_eco/mep/informe_resultados_eco_04.htm. 25. Marc Frank, “Cuba’s new ‘growth’ rate fails to cure old problems,” Financial Times (January 14, 2005); Frank, “Cuba decides to disregard GDP rankings,” The Miami Herald (January 18. 2005); Frank, “2004 Cuban economy grows by 5%—but what is GDP in Cuba?,” Havana Journal.com (January 18, 2005). Table 3. Comparison of GDP at Constant Prices of 1997 (in million pesos and percentages) AEC 2003 AEC 2004 Ratio of GDP Level % change Level % change Levels 2000 26482 — 30531 — 115.3 2001 27268 2.97 31447 3.00 115.3 2002 27686 1.53 32013 1.80 115.6 2003 28502 2.95 33229 3.80 116.5 Source: AEC: Oficina Nacional de Estadísticas, Anuario estadístico de Cuba, various years. 26. 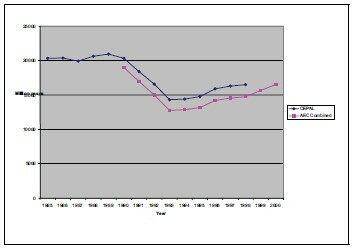 Comisión Económica para América Latina, Cuba: Evolución económica durante 2004 y perspectivas para 2005, LC/MEX/L.664 (20 June 2005). 27. 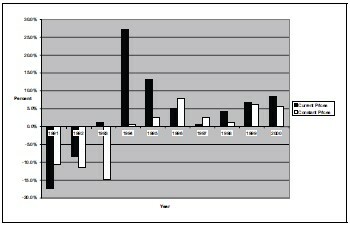 Cuba: Evolución económica durante 2004 y perspectivas para 2005, p. 15. 28. Referring to how the adjustments might have been made, a journalist from a Mexican newspaper reported the following from La Habana: “A Cuban economist, who asked not be identified, told La Jornada that apparently the following method was used: ‘We carried out a given number of heart operations in a given year; what would they cost if we charged the prices of country X?’ Or ‘An English language course was delivered via television; what would it have cost if it had been sold via cassettes as is done in another country?’” Gerardo Arreola, “Cuba se aparta de la ONU para medir el PIB,” La Jornada (January 9, 2005). See also Tomás G. Muñoz, “PIB: Números a conveniencia,” Encuentro en la Red (January 20, 2005) and “Expertos advierten que será más dificil conocer la situación real de la economía cubana,” Encuentro en la Red (January 10, 2005)..
29. On this point see, Jorge F. Pérez-López, “Cuba’s International Trade: Becoming More Invisible,“ Cuba in Transition—Volume 18 (Washington: Association for the Study of the Cuban Economy, 2008), pp. 151–152. 30. Carmelo Mesa-Lago, “The Cuban Economy in 2008–2009: Internal and External Challenges, State of the Reforms and Perspectives,” forthcoming 2010. 31. José Luis Rodríguez, Informe de los resultados económicos del 2005 y el plan económico social para el 2006, http://www.cubagob.cu/ des_eco/mep/informe_resultados_eco_%2005.htm. As is discussed below, this record-setting growth rate was actually exceeded, according to official statistics, in the following year. 32. Interestingly, Minister Rodríguez used as external validator of this very high growth rate a report prepared by ECLAC, which attributed the positive performance to exports of highly complex services and the expansion of tourism and construction, coupled with assistance to Guatemala and Pakistan; as the ECLAC report (Preliminary Overview of the Economies of Latin America and the Caribbean, 2005, December 2005) is based on information provided by the Cuban government, it therefore is of questionable value as an external validator. 33. Economic Commission for Latin America and the Caribbean, Preliminary Overview of the Economies of Latin America and the Caribbean, 2005 (Santiago, December 2005). 34. See, e.g., Oscar Espinosa Chepe, “Cuba, crecimiento no sustentado,” www.cubanet.org (January 30, 2007); Elías Amor Bravo, “Balance de la economía cubana en 2006: análisis y perspectivas,” http://fumacas.weblog.com.pt/arquivo/379924.html (December 19. 2006); Amor Bravo, “¿Por qué no podemos creer que la economía cubana ha crecido en un 12.5% en 2006?, htttp://www.miscelaneasdecuba.net/web/ article.asp?artID=10956 (July 28, 2007). 35. José Luis Rodríguez, Presentación a la Asamblea Nacional del Poder Popular del Informe sobre los Resultados económicos del año 2006 y los Lineamientos del Plan Económico y Social para el año 2007, http://america.cubaminrex.cu/MirarCuba/Articulos/Economia/ 2007/00–00–00/Presentación.htm. 36. Economic Commission for Latin America and the Caribbean, Preliminary Overview of the Economies of Latin America and the Caribbean, 2006 (December 2006). 37. José Luis Rodríguez, Presentación a la Asamblea Nacional del Poder Popular del Informe sobre los Resultados económicos del 2007 y los Lineamientos del Plan Económico y Social para el 2008, http://www.cubagob.cu/des_eco/mep/informe_resultados_eco_2007.htm. 38. Economic Commission for Latin America and the Caribbean, Preliminary Overview of the Economies of Latin America and the Caribbean, 2007 (December 2007). 39. A factor that had a very favorable on Cuban GDP in 2004–2007 was the very high export price of nickel. The London Metal Exchange (LME) annual average price of nickel nearly doubled from $6,772 per ton in 2002 to $13,823 in 2004, $14,728 in 2005, $24,244 in 2006, and $37,216 in 2007. The average price was $21,360 in 2008 and most recently was $11,043 (January-May 2009). See U.S. Geological Survey, Mineral Commodity Summaries—Nickel (January 2009 and earlier issues) and World Bank, Commodity Price Data Pink Sheet (June 2009). 40. Oficina Nacional de Estadísticas, Serie de Cuentas Nacionales de Cuba: Años 1996–2007 (La Habana, julio de 2008), http:// www.one.cu/seriescuentasnacionales.htm. 41. The publication, Serie de Cuentas Nacionales de Cuba: Años 1996–2007 (La Habana, julio de 2008), is available on the ONE’s website, http://www.one.cu/seriescuentasnacionales.htm. 42. “El gobierno dice que la ECLAC ha aceptado su fórnula para medir el PIB,” Encuentro en la Red (December 17, 2008); “Cuba says United Nations accepts GDP formula,” Reuters (December 18, 2008). 43. “La ECLAC dice que La Habana aceptó modificar su método para el cálculo del PIB,” Encuentro en la Red (December 18, 2008). 44. Carmelo Mesa-Lago, “¿Cúal fue el ajuste,?” Encuentro en la Red (January 23, 2008). 45. 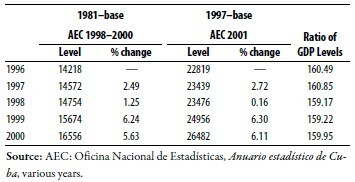 Comisión Económica para América Latina y el Caribe, Balance preliminar de las economías de América Latina y el Caribe, 2008 (December 2008), Table A-2, p. 158. 46. GDP growth rate at constant prices for the year 2008 has been reported in ONE, Panorama Económico y Social 2008 (La Habana, 2009). This statistic is not discussed in this paper, which focuses on the fuller statistics reported in the AEC. 48. The United Nations Development Program in its Human Development Index has for years used surrogate figures and dubious estimates to compute Cuban GDP in international dollars PPP (Purchasing Power Parity), inserting notes about conversations with Cuban authorities to arrive at reliable figures. See Mesa-Lago and Pérez-López, (2005), Cuba’s Aborted Reform, Chapter 4.